Chicago is a food loving town and it’s not unusual to find lines of people going out the doors of a number of the landmark and newer restaurants throughout the city. Garrett's Gourmet Popcorn, a Chicago landmark established in 1949, is one of those places. If you have ever tried any of their air-popped popcorn flavors or their famous “Garrett Mix” (cheddar cheese and Caramel Crisp popcorn combined), you know why they call this gourmet. In Chicago, a trip to Garrett’s Popcorn Shop has become a must for any visitor, a decadent treat to allow yourself during that special trip to the windy city. However, fortunately for New Yorkers, Garrett has come to the Big Apple at their one and only location in the city on 34th street between 7th and 8th Avenue. 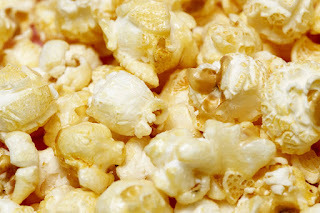 Gourmet anything should be done right, and if you are having gourmet popcorn it’s worth it to make it an occasion. Garrett’s Gourmet Popcorn is definitely the occasion.